These pendants are eye catching and fun to make. 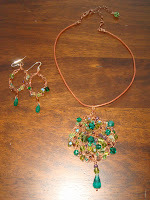 This one was made with various shades of green Czech crystals on copper wire. The matching earrings are very light weight and have a green crystal drop. They can be worn with any color but I love to wear this set with black, brown and purple. It's called Beginners Luck because it is the first piece of jewelry I made and I received so many compliments!